Asuncion The headquarters of the Confederacion Paraguaya de Trabajadores or CPT is located on a gritty street near central Asuncion named after an historic colonial general named Yergos. The imposing brick wall on the corner of the street hosts a small plaque that commemorates the location as the home of the federation. Walking through the arched opening into the property, we were ushered into a large open room with a table and chairs in front of the CPT banner hanging on the wall. The wall facing the street had pictures of past presidents, all wearing red ties, but otherwise black-and-white. There was scaffolding in half of the room, presumably for some kind of roof or ceiling work, except there was no ceiling as such, but beams and brick exposed twenty feet above the floor. 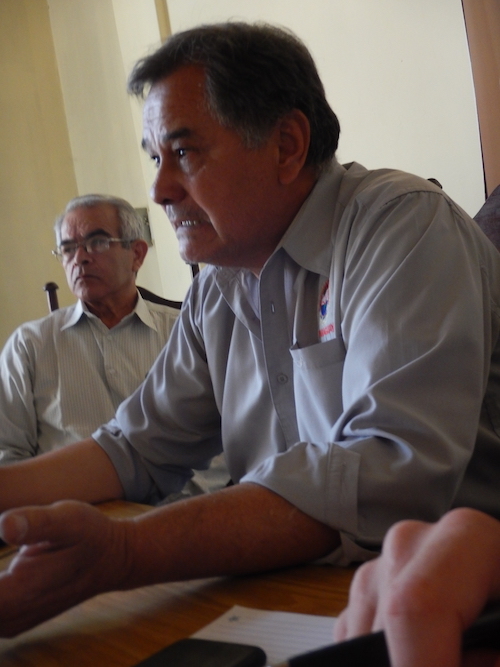 We were meeting with the CPT’s President Francisco Britez and his Vice-President. Britez is also the General Secretary of the taxi drivers’ union. 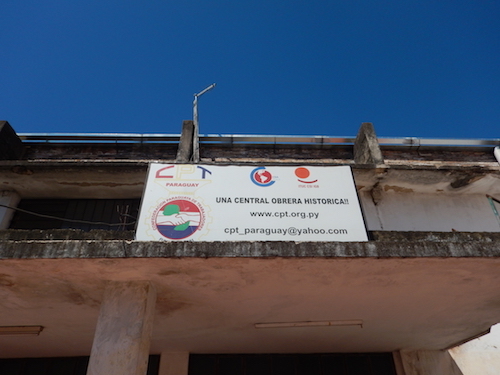 The building said much about the struggle of labor unions to find and hold their place in Paraguay over the years. 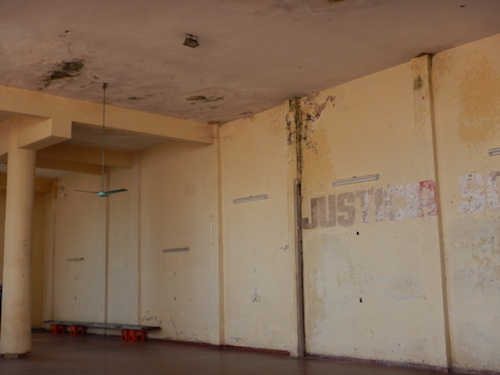 Britez told us that the building had been owned by the Labor Ministry, but had been given to the CPT, and then taken away from them when the CPT was one of the leaders in the protests to end the Strasser dictatorship in the late 1980s in Paraguay. They had managed to get possession of the property again, but it was in some dispute because the Labor Ministry claimed to have lost the property transfer paperwork, though fortunately the CPT still had the records. Though there were cracks in the walls and ceilings, the meeting hall was cavernous. Only weeks before President Britez told us that 1000 campesinos had met there as they prepared demands and protests concerning government action. 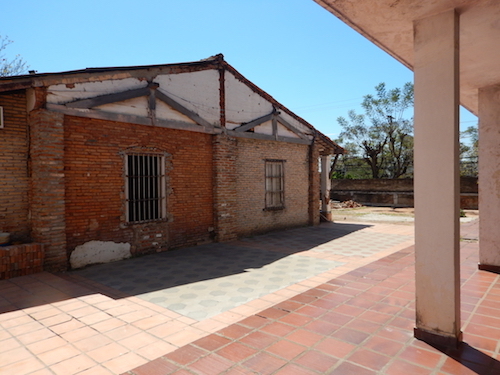 The hall is frequently used by social movements and others seeking change in Paraguay. We were unclear how often the unions of the federation met there in common cause. The CPT had 65 affiliated unions and eight larger union amalgamations from what I understood. They told us that there were 500,000 members out of 3 million workers in labor unions. We were unclear how many were part of the federation, though Wikipedia said they had 43,000 members. We inquired about their role in the recent presidential elections. They claimed to be rigorously nonpartisan as a federation, but more discussion seemed to indicate that a number of their affiliates had strongly, though perhaps not overtly, pushed members to vote to empower the more conservative and long ruling Colorado Party. Though they didn’t say so explicitly, such action seemed to frustrate and tie the hands of the CPT leaders to even more determinedly stay out of the way of their larger affiliates in order to avoid the crossfire of any partisan politics. They were frustrated over their meetings with the Labor Ministry and its lack of follow through. They conceded that the constitution and legal framework for unions and the right to organize was strong in Paraguay, but laughed bitterly at the weak enforcement of any labor laws. Asking about informal workers, Britez seemed to answer with a complaint against foreign workers and an argument that informal workers were able to make a better income than formal workers. Asking about any organizing program, and the main response seemed to be their grievance about an inability to get their program taught in the schools. Asked about an encampment protest near the Congress building and whether it was about pensions, they seemed to be saying it was about displacement, but then arguing some sympathy for a proposal that would allocate pension money for infrastructure improvements in the country. Thirty years after the end of the dictatorship, labor unions are still facing a long road to rebuilding with minimal resources and immense challenges to secure their place in the work and political life of the country, while grappling uneasily with the future at the same time. 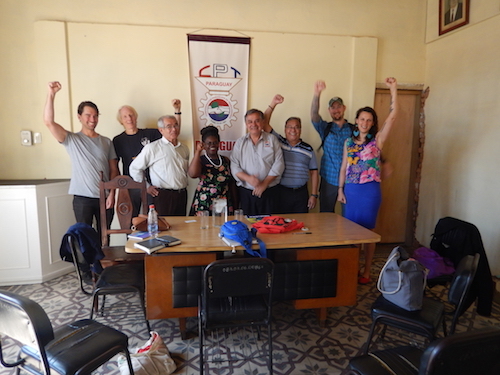 This entry was posted in Citizen Wealth, Financial Justice, Ideas and Issues, International, Labor Organizing, Organizers Forum and tagged Asuncion, Confederacion Paraguaya de Trabaladores (CPT), Paraguay, President Francisco Britez by Wade. Bookmark the permalink.